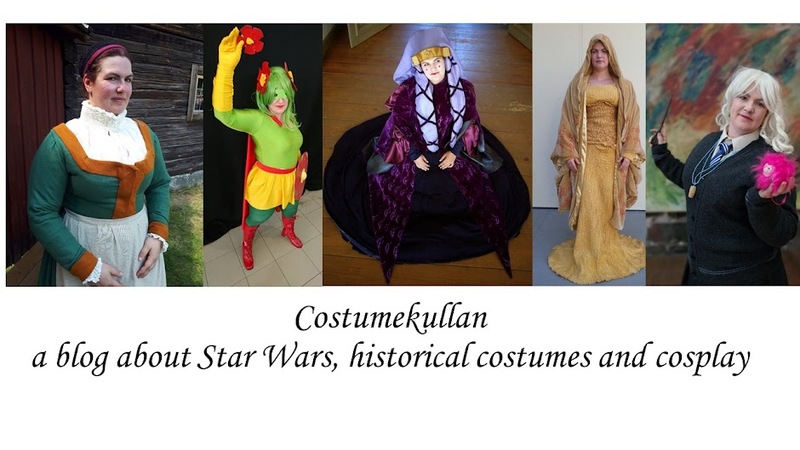 After having worked on detailed costumes, it's always fun to do something totally different. 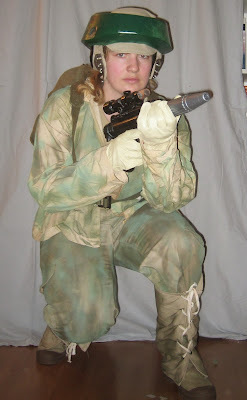 My project for the spring 2013 was the Endor Rebel Trooper, from Star Wars Episode VI Return of the Jedi. Ok, it was really my autumn 2012 project, but I switched it for Endor Leia instead. 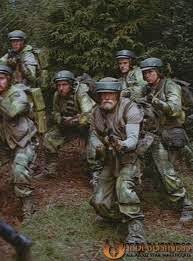 These are the strike force that beats the Empire, together with the Ewoks. Funny enough some of the original costumes were made from snow jackets from the Swedish military in the 1940's. Not so easy to get hold of today, but I had a friend who managed to acquire a pair.Not many people in the Rebel Legion go with the snow jacket version though, because it's almost impossible to find them outside Sweden today. A big differernce with this project, compared to my other costumes, is that this is a costume where you more or less buy ready made parts and just put them together with some finishing touches. The one thing that involved a bit of construction is the helmet. It consists of two parts, a soft inner helmet based on the WW2 AN-H-15 flight helmet. I own one such flight helmet, since it's used for the A-wing costume, and that was a really good help when I needed to make my own version of it from scratch. To make the soft helmet I used this pattern and tutorial.I don't know if it has to do with the pattern being made in American measurements, and then printed on a printer with European measurements, but the size is gigantic. I had to more or less remove most of the middle section, thankfully the ugly seams that were the result of that are hidden beneath the ribbed part that goes over the top of the head. That ribbed part and the bill are differences from the original flight helmet, and the reason why I didn't use my original helmet for this costume. The hard part of the helmet, "the donut" was bought from a maker on the Rebel Legion. This project was a good example of how costumers help each other. I'm a seamstress, so I made the soft inner helmets, and in exchange another costumer gave me the snow jacket, and painted the hard plastic helmet for me. The only thing except for the soft helmet that I made myself were the gaiters, the tubes of fabric that go from the shoes and up the lower leg. Everything else was found, and most of it on ebay since I don't live close to any military surplus store. I've heard of people simply walking into such stores and more or less coming out with all the parts needed for a costume. The gun is a repainted and slightly modified Hasbro rebel blaster nerf gun. Even if I didn't construct the costume parts, I still had to camouflage paint them, to get a proper pattern. Pre-made camouflage fabric is wrong both in colour and when it comes to the patterning. I bought a couple of cans with spraypaint in different green shades, from olive to light green. I then covered my whole bathroom with plastic and started to spray. I had also teadyed the snow jacket before starting the camouflage painting. 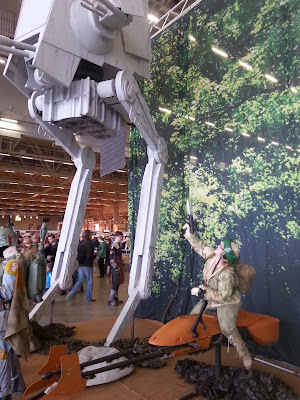 I debuted the costume at Model Expo in Finland 2013, where the Fins had built a whole Endor set, including a speeder bike and an AT-ST in life size. This is also a fun costume in that now I have the basic configuration, but then you can basically add as many bags, pouches, guns and other details as possible. I hope to one day have a proper, big, rifle for example and I want to make a vest to go over he snow jacket as well.